Nathan Kirkpatrick has been serving at the Advocate since 2013. He was ordained as a priest December 20, 2015. 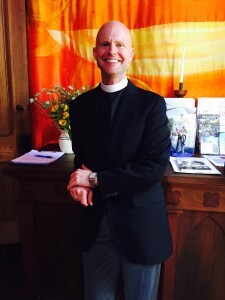 Raised in the mountains of North Carolina, Nathan graduated from Wake Forest University and Duke Divinity School and served as a parish pastor in the United Methodist Church. Ten years ago, he joined the staff of the Divinity School at Duke University and now serves as the Managing Director of Leadership Education at Duke Divinity. In this role, he designs and teaches in a number of leadership development programs for congregational, denominational and institutional leaders. Nathan has a keen sense of church and leadership, and is a gifted preacher and group facilitator. He has wide experience in multicultural, intergenerational, and interfaith settings, having been invited to preach and teach at churches and conferences around the country and on three continents. Nathan is a PhD. candidate at the University of Durham in Durham, England, and is writing his dissertation on the future of theological education. He has particular interest in how theological education might lead to the cultivation of the “mind of Christ” within faith-based communities of learning and practice. At the Advocate, Nathan helps facilitate Indulgences, preaches regularly, and assists in the liturgy. He also helps keep fresh ideas and possibilities before us, and keeps us aware on the latest interesting books and articles about the 21st century church.